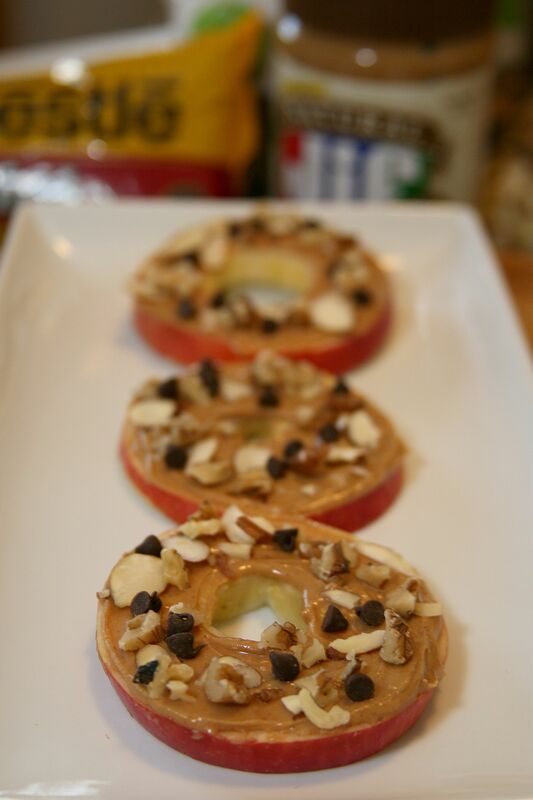 This apple peanut butter snack is incredibly easy to put together and tastes great! It would be perfect for breakfast in the morning or a snack later in the day! My step daughter is always pleased to see this on her plate when she asks for a snack and it’s something I’m happy to make for her because I know she’s getting some good nutrition from it! You could certainly switch up your toppings for the apple too! In my version, I used peanut butter, almonds, walnuts and mini chocolate chips. You could easily trade some of those items for almond butter, different nuts and something I’d like to try next time, dark chocolate chips. As you can imagine, there’s not much of a recipe for this. Simply select your choice of toppings and assemble your sliced apples! Always exciting to find something that’s a combination of tasty and healthy! !